The accuracy of CT as a diagnostic tool for chronic obstructive pulmonary disease (COPD) may improve if radiologists analyze sagittal reconstruction to look for characteristics of obstructive airway disease. Use of sagittal reconstruction can help identify up to 27% more patients with COPD than traditional imaging findings alone, according to findings of a study conducted by radiologists at the Hospital of the University of Pennsylvania in Philadelphia. Statistics from the American Lung Association (ALA) state that more than 11 million people living in the United States have been diagnosed with COPD, and that an additional 12 million may be undiagnosed. In its January 2015 fact sheet, the World Health Organization (WHO) reported that more than three million people died of COPD in 2012, equal to six percent of all deaths in the world. Treatment can slow the progress of the disease, so early detection is important. Unfortunately, according to the results of many peer-review published clinical studies, many patients with COPD do not show its classic imaging features such as air trapping, bronchial wall thickening, tree-in-bud opacities, thoracic cage ratios, emphysema, or bronchiectasis. Professor of radiology Wallace T. Miller Jr., MD, and colleagues recognized that the current evaluation of high resolution CT images for features of obstructive airway disease relies solely on axial findings, but that much of the information about COPD on chest radiographs was found on the lateral radiograph in the non-axial plane. They hypothesized that similar information from the lateral chest x-ray could be obtained from sagittal reconstructions on CT scans. 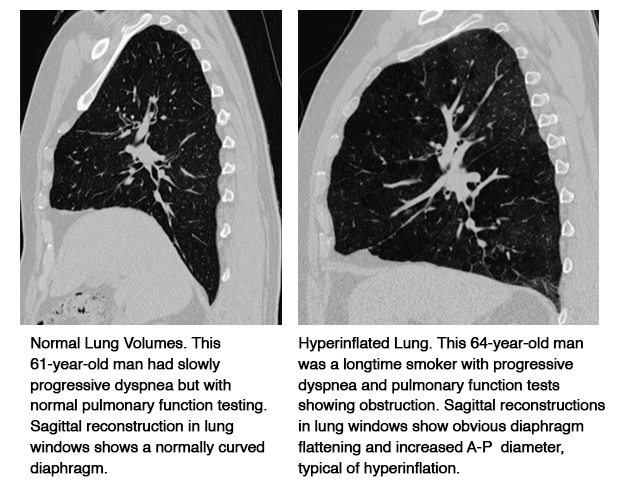 They conducted a retrospective study evaluating the sensitivity and specificity of findings on sagittal reconstructions in the diagnosis of COPD compared with the standard axial findings of obstructive lung disease. They also wantedto determine the fraction of additional cases identified with the new features of obstruction. The study included 216 cases of patients who had undergone CT scans of the thorax followed by pulmonary function tests (PFTs) within 90 days of their CT exam during a two year time period. Patients diagnosed with obstructive lung disease by PTF were subcategorized into five categories. The remaining patient cohort was categorized as having restrictive, normal, or respiratory impairment. Four radiologists independently evaluated the axial images from each exam, noting the presence or absence of emphysema, bronchial wall thickening, bronchiectasis, air trapping, interstitial lung disease, and large airway mucus. At least two weeks later, they evaluated the sagittal images for the subjective sense of hyperinflation (diaphragm flattening and increased AP diameter) of the left and right hemithorax without looking at the axial images. This subjective measure of hyperinflation was compared with objective measurements of diaphragm flatting, AP diameter, and lung apex to diaphragm height. It turned out that the subjective sense of hyperinflation of the sagittal images performed as well as the objective measures of hyperinflation. Both had similar accuracy in the diagnosis of COPD, but with less interobserver variability than the traditional measures of obstructive lung disease found on the axial images. Furthermore, addition of the information from sagittal images allowed the most experienced reader to identify 27% more patients with obstructive airways disease than was found by the axial images alone. In an interview, Dr. Miller explained the “back to the future” aspect of this recommendation. He noted that it is common knowledge that obstructive lung disease is known to cause hyperinflation of the lungs, and that the best imaging measure of this was identification of flattening of the diaphragm and increased anterior to posterior diameter of the thorax on the lateral chest radiograph. Early CT could identify emphysema better than chest x-rays, and began to be used even though images other than the axial plane were of poor quality. Hightower JS, Amadi C, Den E, et al. Back to the future: sagittal CT in the evaluation of COPD. Published online November 11, 2015 in European Radiology. Sagittal reconstruction improves identification of COPD by CT. Appl Radiol.